There is a very famous story by the American author Mark Twain called "The Prince and the Pauper." In the story, a prince invites a poor beggar into his castle, and for fun, the two exchange clothes. Unfortunately for the prince, he is then mistaken for the beggar, and is thrown out of the castle. The beggar, on the other hand, being mistaken for the prince, is kept in the castle and lives the life of a prince. Now, in this story, both the prince and the pauper were surprised when people mistook their identities. And had the prince known that he would be thrown out of the castle, he never would have agreed to change clothes with the beggar. Dabbling in such simple fun as trading clothes could never be worth losing so much power and privilege. In some ways, the situation in Colosse during the first century resembled the story of "The Prince and the Pauper." The Christians in Colosse were being encouraged to participate in pagan forms of worship. So, Paul wrote to remind them of the tremendous riches and royalty they already enjoyed in Christ, and to warn them not to trade these blessings for the meager benefits that idolatry pretended to offer. 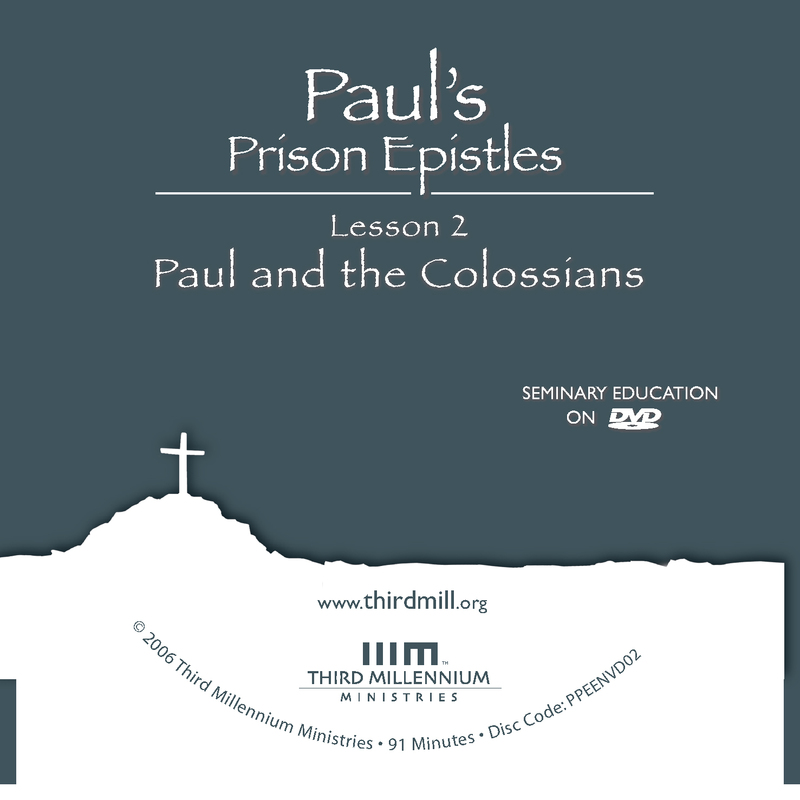 This is the second lesson in our series Paul's Prison Epistles . And we have entitled this lesson "Paul and the Colossians." In this lesson we will be studying Paul's canonical letter to the Colossians. As we will see, in this letter Paul responded strongly to heretical teachings that introduced the veneration of lesser spiritual beings into Christian worship. Our study of Paul and the Colossians will divide into three parts. First, we will explore the background of Paul's letter to the Colossians. Second, we'll investigate the structure and content of his letter to the Colossians. And third, we will focus on the modern application of this letter. Let's turn first to the background to Paul's letter to the Colossians. Paul was an apostle of Jesus Christ, and writing letters was an aspect of his authoritative ministry as Christ's representative. Another part of being an apostle was pastoring churches and individuals. And so Paul's letters were not just collections of authoritative teaching. Rather, they were personal and pastoral, motivated by love and concern for the churches and people to whom he wrote. And Paul's letters were also "occasional." That is, they were written to address specific issues in particular times and places. So, as we study Paul's letter to the Colossians, it is important for us to know something about the occasion that prompted Paul's writing. We have to ask questions like: What problems did the Colossians face? What motivated Paul to write to them? We'll approach the background to Paul's letter to the Colossians from two directions. First, we'll mention some details of his relationships with the Colossian church in general, and with individuals within the church. And second, we'll investigate some of the problems in Colosse that concerned Paul. Let's begin by looking at Paul's relationships with the Colossians. Paul did not have the same relationship with every Colossian Christian, so we will focus first on his relationship with the church in general, and then on his relationship with specific individuals. Let's turn first to his relationship with the church in Colosse. Now, Paul had traveled through Phrygia during his second and third missionary journeys, but for some reason he had not visited the Colossian church. Possibly, he had been to Colosse prior to the establishment of the church there. Or perhaps he had visited the city but not had the opportunity to meet the church. It is also possible that he had never even visited the city of Colosse. Whatever the case, Paul did not know most of these believers personally. Nevertheless, we are able to learn some things about Paul's relationship with the Colossians from the details in Paul's letter to them, as well as from his letter to Philemon, who lived in Colosse. For one thing, we read that Paul had an indirect relationship with the Colossians through representatives, such as his Colossian friends Epaphras, Philemon and Onesimus, and his messenger Tychicus. Second, although they had not met face to face, Paul and the Colossians corresponded with each other. For instance, Epaphras had brought reports of the Colossians to Paul. And Paul sent at least one letter to the church in Colosse, namely the New Testament epistle to the Colossians. Paul regularly prayed specifically for the Colossians, asking for the blessings he knew would most benefit them. Fourth, the Colossians ministered to Paul as well. We learn from Paul's letters to the Colossians and to Philemon that the Colossian men Epaphras and Onesimus visited Paul in prison. And since the Colossian church sent messengers to Paul, it is reasonable to assume that they prayed for him too. In short, even though Paul had not personally met most of the Colossian believers, they shared affection and affinity for one another, making their relationship real and substantial. Having seen the nature of Paul's relationship with the church in Colosse, we should look at his relationship with specific individuals within the Colossian church with whom he was more familiar. To Philemon our dear friend and fellow worker, to Apphia our sister, to Archippus our fellow soldier and to the church that meets in your home (Philemon 1-2). Philemon, at least, was a close friend of Paul. And Paul's mention of Apphia would seem to indicate that he knew her as well. Many scholars believe that she was a member of Philemon's household — probably his wife. Since Archippus was a person of status within the church, Paul's address to him might be honorary. But it is more likely that he was also part of Philemon's family, perhaps his son. Another of Paul's friends from Colosse was Epaphras. Paul referred to Epaphras as his fellow worker and fellow prisoner, and mentioned that Epaphras was a faithful minister of Christ. Epaphras remained with Paul in prison when Paul sent his letter to the Colossian church. Paul's friend Onesimus was also from Colosse. Onesimus was a slave who sought out Paul after fleeing from Philemon, and who ended up ministering to Paul in prison. Most of Paul's friends seem to have been associated in some way with Philemon. But whatever their relationships to one another, it is clear that Paul had closer relationships with these friends than he had with the church in Colosse in general. But as his letter to the Colossians shows, it is also clear that his relationships with these friends increased his love for all the believers in Colosse. So then, generally speaking, Paul had a fairly minimal personal relationship with the Colossian church. But he also cared deeply and personally for several of its members. He had strong feelings for their church not only because he was an apostle, but also because of its association with his friends. Having examined Paul's relationships with the Colossians in general and with particular individual Colossians, we are ready to investigate the problems in Colosse that concerned Paul. What difficulties did they face? What prompted Paul to write to them? While Paul was in prison, he was visited by a man named Epaphras, who was from the city of Colosse. And Epaphras told Paul about some false teachings that were threatening the churches of the Lycus Valley, including the church in Colosse. So, in order to defend the church against these false teachings, Paul wrote his letter to the Colossians. Although we do not know all the details of the errors that had come into the church in Colosse, Paul's letter tells us several things about them. First, the false teaching in Colosse seems to have mixed Christianity with elements of Greek philosophy. Second, it depended heavily on Jewish law. And third, it insisted that there were many angelic beings that Christians were required to venerate and to appease. Let's look first at the aspects of this teaching that related to Greek philosophy. I am struggling for you … in order that you may know the mystery of God, namely, Christ, in whom are hidden all the treasures of wisdom and knowledge… so that no one may deceive you by fine-sounding arguments (Colossians 2:1-4). Paul's words here indicate that the Colossians valued mystery, wisdom and knowledge, all of which Greek philosophy and religion typically valued. So, in response to the claims of the false teachers in Colosse, Paul emphasized that true mystery, wisdom and knowledge were found only in Christ, and not in pagan religion. See to it that no one takes you captive through hollow and deceptive philosophy, which depends on human tradition and the basic principles of this world rather than on Christ (Colossians 2:8). Here, Paul directly labeled the false teaching hollow and deceptive philosophy. As we have seen, in typical Greek usage, the word philosophy referred to religious speculations based on traditions, not to purely intellectual or rational study. These verses strongly suggest that the false teachers in Colosse were enamored with beliefs and practices based in Greek religion and occult mysticism. To gain acceptance in the church, they probably embraced some elements of Christianity. But they clearly did not embrace Christianity as it was taught by the apostles, or else they would not have relied on occult tradition as the basis of their system. Since you died with Christ to the basic principles of this world, why … do you submit to its rules: "Do not handle! Do not taste! Do not touch!"? … Such regulations indeed have an appearance of wisdom, with … their harsh treatment of the body, but they lack any value in restraining sensual indulgence (Colossians 2:20-23). Paul objected to the ascetic practices in Colosse for at least two reasons. First, their asceticism was based on the basic principles of the world. As we will see later in this lesson, this language refers to spiritual beings and angelic powers. Second, it was of no value in resisting sin, and thus provided no benefits. In summary, then, the false teachers in Colosse tried to mix the church's teachings with Greek traditions that were supposed to bring wisdom and strengthen believers against temptation. But in reality, the wisdom they offered was false, their practices were worthless, and their teachings denied the supremacy of Christ. In addition to promoting Greek philosophy, the false teachers in Colosse incorporated many practices based on Jewish law. However, their use and understanding of Jewish law departed both from traditional Judaism and from proper Christian practices. As we have seen in other lessons, Paul upheld the Mosaic Law. And he was willing to accept and participate in many traditional Jewish practices for the sake of the gospel. So, if the false teachers in Colosse had employed the Law in a valid way, Paul would not have criticized their use of it. His criticisms indicate that the false teachers were using Jewish teachings and practices in corrupt ways. Do not let anyone judge you by what you eat or drink, or with regard to a religious festival, a New Moon celebration or a Sabbath day (Colossians 2:16). These are a shadow of the things that were to come; the reality, however, is found in Christ. Do not let anyone who delights in false humility and the worship of angels disqualify you for the prize (Colossians 2:17-18). The Mosaic law did not associate holy days with the worship of angels, but with the worship of God. And it did not advocate a special diet as a means of humility or asceticism, but as a sign of being set apart as God's special people. The false teachers, however, had corrupted these laws, using them in idolatrous worship and pagan asceticism. In him you were also circumcised … not with a circumcision done by the hands of men but with the circumcision done by Christ, having been buried with him in baptism (Colossians 2:11-12). Apparently, the false teachers in Colosse were advocating a form of Christian circumcision. So, Paul associated circumcision and Christian baptism in order to teach the Colossians that because they had been baptized, they did not need to be circumcised. In short, in Colossians Paul wrote against abuses of the Mosaic law; he did not write against the law itself. Elsewhere, Paul affirmed that the law of Moses is a proper basis for Christian morality and practice, and that it teaches us many true things about God. But here in Colossians, he concentrated on refuting the specific teachings and practices of the false teachers, condemning the ways that they had corrupted particular statutes in the law, and insisting that the church reject these corruptions. Besides employing Greek philosophy and adopting practices based on Jewish law, the false teachers in Colosse promoted the worship of spiritual beings, encouraging Christians to venerate and appease these powers. That the Colossian church was courting the worship of spiritual powers is evident in at least three ways. First, Paul wrote of the worship of angels. Second, he addressed the matter of rulers and authorities. And third, he dealt with problems related to the basic principles of this world. We should begin by looking at his mention of angel worship. Are not all angels ministering spirits sent to serve those who will inherit salvation? (Hebrews 1:14). Do not let anyone who delights in … the worship of angels disqualify you for the prize. Such a person goes into great detail about what he has seen, and his unspiritual mind puffs him up with idle notions (Colossians 2:18). The false teachers claimed to have received visions from angels, and on this basis they encouraged other Christians to complete the proper rituals so that they might receive similar visions. And perhaps the false teachers really had experienced visions, though these would have been from demons rather than from God's holy angels. Alternatively, they may simply have experienced self-induced or even drug-induced ecstatic trances. Or they might even have been lying. Whatever the case, this exaggerated view of the power and influence of angels was not uncommon in the ancient world. Some Jewish teachers maintained comparable ideas about angels. And some Greek philosophies taught similar things about their oracles and astral powers. Sadly, the familiarity of these ideas to the Colossian Christians probably made the false teachings sound reasonable, allowing these false doctrines to gain a foothold in the Colossian church. Now that we have looked at Paul's direct references to the worship of angels, we should turn to his discussion of rulers and authorities. In the language of the first century, the terms "powers" and "authorities" referred to spiritual beings such as angels. Here Paul mentioned thrones, powers, rulers and authorities. Thrones and powers translate forms of the Greek words thronos and kuriotes. Both these words commonly referred to human kings and other earthly rulers, but they could also refer to spiritual beings. Rulers and authorities, in turn, translate forms of the Greek words arche and exousia, words that usually refer to invisible spiritual powers, such as angels and demons. In the worldview of the false teachers in Colosse, the angelic and demonic spiritual authorities were significantly greater than their earthly human counterparts. The false teachers greatly exaggerated the power of angels and demons, so much so that they attributed to these invisible rulers actions and abilities that in reality belong to Christ alone. For by him all things were created: things in heaven and on earth (Colossians 1:16). Paul went on to say that the spiritual forces and Christ were in direct conflict. The false teachers thought that worshiping Christ was compatible with worshiping spiritual authorities. But Paul indicated that regardless of how the false teachers envisioned the spiritual beings they worshiped, the truth was that only demons allow themselves to be worshiped. God's holy angels have no part in such idolatry. And Christ does not permit the worship of his enemies. Through the cross of Jesus Christ, God disarmed and triumphed over the spiritual powers and authorities. In other words, the spiritual powers and authorities opposed God in spiritual war — they were rebellious, evil spirits, enemies of God. They were demons, not holy angels. But through Jesus Christ, God had stripped these demons of their ability to fight and had humiliated them in defeat. These fallen, powerless, defeated demons were the spiritual powers worshiped by the false teachers in Colosse, the ones to which Paul referred as "rulers and authorities." Now that we have explored Paul's mention of angels and of spiritual rulers and authorities, we are in a position to see how Paul spoke of the basic principles of this world. As we have already said, this was yet another phrase that referred to spiritual beings. In the first century, the Greek term stoicheia, which may be translated "basic principles," commonly referred to the gods and spiritual powers that were associated with the stars and planets. Stoicheia was also used to refer to the four basic physical elements: earth, wind, fire and water. These basic principles or elements were thought to influence and even control the fates of men and women. Formerly, when you did not know God, you were slaves to those who by nature are not gods… how is it that you are turning back to those weak and miserable principles? (Galatians 4:8-9). Paul pointed to the basic principles or stoicheia as the basis for the philosophy of the false teachers. In other words, he was arguing that the religious traditions of the false teachers should be rejected because they appealed to false gods. Interestingly, similar ideas about the elements and spiritual powers were held by some branches of Judaism, especially during the intertestamental period. This seems to have set the stage for the Christian heresy that appeared in Colosse in Paul's day. The false teachers in Colosse appear to have combined Jewish legalism, pagan religion and Christianity, and to have encouraged the worship of these astral or cosmic powers commonly known as basic principles or stoicheia. The church in Colosse faced some real challenges in the first century. Unlike other churches, they apparently had never received apostolic training. Although the church had been planted by godly men, it had not been solidly grounded in the theology of the apostles. This made the Colossian Christians particularly vulnerable to false teaching. So, when false teachers began to bombard them with corruptions of Judaism and pagan idolatry, it was hard for them to tell the difference between truth and heresy. Wisely, they recognized their problem and appealed to Paul for help. Now that we have surveyed the background to Paul's letter to the Colossian church, we should turn to our second topic: the structure and content of Paul's letter to the Colossians. Paul's letter to the Colossians can be divided into four major sections: A salutation in 1:1-2; encouragements of thanksgiving and intercession in 1:3-14; the main body dealing with the supremacy of Christianity in 1:15–4:6; and final greetings in 4:7-18. The salutation, in 1:1-2, identifies the apostle Paul as the authoritative author of this letter, and mentions that the letter also comes from Paul's disciple Timothy. It is clear that Paul is the primary author because only he signed the letter. Also included in the salutation is a short blessing that functions as a greeting. The encouragements of thanksgiving and intercession, found in 1:3-14, follow reports about the Colossian church that Paul received from Epaphras. Epaphras was the minister who founded the church in Colosse. You will recall that he also spent time with Paul during his imprisonment. While visiting Paul, Epaphras informed the apostle of the faith and love of the Colossian believers, and the two men spent much time in prayer for the Colossian church. So, when Paul wrote to them, he told them how he continually thanked God for their faith and salvation. And he let them know of his constant prayer that the Lord would bless them, especially by giving them spiritual discernment, and by strengthening them to do good works. In the closing portion of Colossians, the section of final greetings in 4:7-18, Paul sent greetings to the Colossians from the many people who were with him in prison. The closing indicates that Paul sent this letter to the Colossians in the care of Tychicus and Onesimus. Tychicus also delivered the letter to the Ephesians, and Onesimus delivered the letter to Philemon. This seems to indicate that all three letters — Colossians, Ephesians and Philemon — were written and delivered at approximately the same time. The closing also mentions a letter to the church in Laodicea, and instructs the Colossians to read that letter, as well as to share their own letter with the Laodiceans. This lets us know that even though Paul wrote these letters to specific people in particular circumstances, he also intended them to be applicable to different audiences. As we will see in a later lesson, it is possible that Paul's letter to the Ephesians is the very one mentioned here as the letter to the Laodiceans. The main body of Paul's letter to the Colossians begins in 1:15 and runs through 4:6. This section details the supremacy of Christianity over the religion of the false teachers. Paul's discussion of the supremacy of Christianity falls roughly into four main subdivisions: First, the supremacy of Christ in 1:15-20. Second, the supremacy of Christ's ministers in 1:21–2:5. Third, the supremacy of salvation in Christ in 2:6-23. And fourth, the supremacy of Christian living in 3:1–4:6. We will briefly survey each of these sections, beginning with the first section, which focuses on the supremacy of Christ himself. False teachers were trying to persuade the Colossian church to worship cosmic, spiritual powers. And they were encouraging an ascetic lifestyle, thinking that such harsh living would placate the spiritual powers, and reap some benefit from these false gods. So, Paul began to refute these heresies by showing that Christ is supreme over all other so-called gods. On the one hand, Paul insisted that Christ is the king of all creation, and that he possess all perfections and authority. On the other hand, Paul taught that the basic principles of the world are incapable of delivering the blessings of salvation, and are unworthy of reverence. Paul listed many important aspects of the supremacy of Christ in Colossians 1:15-20, and most of these details contrast with the false teachings in Colosse. Among the details Paul outlined here, he spoke of Christ as the image of God in Colossians 1:15, the firstborn over all creation also in Colossians 1:15, the agent of creation in Colossians 1:16, the supreme Lord in Colossians 1:18, God incarnate in Colossians 1:19, and the only reconciler in Colossians 1:20. He is the image of the invisible God, the firstborn over all creation… all things were created by him and for him (Colossians 1:15-16). Although the Scriptures speak many times of all human beings as the image of God, here Paul had in mind something that was unique about Jesus, something associated with his power and authority over creation. He had in mind the way the false teachers in Colosse used the expression "image of God" as they borrowed it from Greek philosophy. In at least some Greek philosophies of Paul's day, the universe itself was thought to be God's image, meaning that it was the greatest revelation of God, and that one could obtain knowledge and wisdom through its revelation. We find references to this idea in writings as old as Plato's Timaeus , which is from the fourth century B.C., as well as in Gnostic writings about the god Thrice Great Hermes that come from the second and third century A.D. So, whereas the false teachers looked to the planets and elements as the image of God, Paul pointed to Christ as the image of God. He adopted this Greek philosophical meaning of the term "image of God" in order to show that Christ, and not the demons worshiped by the false teachers, was the ultimate revelation of God, the one to whom believers should look for greater wisdom and knowledge of God. The Greek term prototokos, here translated "firstborn," often referred to superiority and authority rather than to order of birth. In the ancient world, the firstborn child in a family was not necessarily the one who was born first. Rather, the firstborn was the one who had the greatest rights of inheritance. He was typically the one who would lead the family after his father's death. For instance, the oldest male child was considered the "firstborn" even if he had older sisters. And beyond this, a younger male child could become the firstborn if the oldest son was demoted from his position for some reason. Now, we should point out that some rather prominent cults have wrongly understood this term "firstborn" to indicate that Christ was actually "born" before the world was created. That is, they believe that Christ has always been a creature, so that he is not equal to God the Father in power and authority. But Paul associated Christ's status as "firstborn" with his authority and supremacy over all creation, and said nothing about a time when Jesus did not exist. When Paul said that Christ was the firstborn over all creation, he meant that Christ was the one who possessed the birthright of the Father, not that Christ was born or created before all others. He did not mean that Christ was part of creation, but that Christ was Lord over it. By expressing himself in this way, Paul made it clear that the false gods of the false teachers had no power or authority to give any blessings to anyone. Christ and Christ alone was the firstborn, the one who inherited all the blessings of God, and who alone could give them to others. As we have already seen, the words "rulers and authorities" refer to spiritual powers, such as the demons worshiped by the false teachers. And according to Paul, these rulers and authorities are all subject to Christ. Christ's priority as the agent of creation makes him far superior to everything within creation. He is the head of the body, the church; he is the beginning and the firstborn from among the dead, so that in everything he might have the supremacy (Colossians 1:18). Paul argued that Christ has been given special status in the church and among the dead "so that in everything he might have supremacy." That is to say, God orchestrated creation as he did for the specific purpose of making Christ supreme. The Father sought to honor the Son, and to place him as Lord over all. Therefore, any system that seeks to supplant or qualify Christ's unique sovereignty must be false. And of course, this includes Greek philosophy and Jewish mysticism. For God was pleased to have all his fullness dwell in him (Colossians 1:19). All the fullness of God dwells in Christ, making Christ the incarnation of the supreme God. The rulers and authorities worshiped by the false teachers in Colosse were lesser spiritual beings. Although they were sometimes called gods by Greek philosophy, they were not generally thought of as supreme deities. By contrast, all the fullness of God dwells in Jesus Christ. This means that Christ is the incarnation of the God who created the universe, the one whom all others must obey as Lord. This makes Christ far superior to the lesser spiritual beings worshipped by the false teachers. For God was pleased … through him to reconcile to himself all things, whether things on earth or things in heaven, by making peace through his blood, shed on the cross (Colossians 1:19-20). God plans "through Jesus to reconcile to himself all things." That is, Jesus Christ is the agent and the means through whom God is purging sin from the world, and making peace with humanity. The feeble powers worshiped by the false teachers were demons, concerned with stealing glory and authority from Christ and using it to tyrannize their worshipers. Their goals were petty, and they lacked the ability to bless their worshipers in a meaningful way. But Christ was the way to God. The gospel Paul preached was that God was restoring all of creation to a sinless, pristine and eternally blessed condition. And he was doing this through Jesus Christ, and only through Jesus Christ. Through Jesus alone, sins could be forgiven and God's favor gained. There was no need to bother with the petty and powerless spirits of the false teachers. Access to God and his eternal blessings was freely available in Jesus. In at least these six ways — Christ as the image of God, the firstborn over all creation, the agent of creation, the supreme Lord, God incarnate, and the only reconciler — Christ is superior to all the so-called gods worshipped by the false teachers in Colosse. After demonstrating the supremacy of Christ over the spiritual powers, Paul asserted the supremacy of Christ's ministers. This portion of his argument appears in Colossians 1:21–2:5. He has reconciled you by Christ's physical body through death to present you holy in his sight, without blemish and free from accusation … This is the gospel that you heard … and of which I, Paul, have become a servant (Colossians 1:22-23). Christ's ministers are superior because they preach a gospel that actually reconciles believers to God. The false teachers in Colosse encouraged people to placate demons, and perhaps they also offered reconciliation with God. But in reality, no reconciliation ever took place for them because their so-called gospel had no power to save. By contrast, the Colossian believers had already experienced the true reconciliation that comes through the true gospel preached by God's ministers. They were already forgiven and stood before God clothed in the righteousness of Christ. This should have encouraged them to trust in Paul's word and to reject the false teachers. I fill up in my flesh what is still lacking in regard to Christ's afflictions (Colossians 1:24). As we saw in a prior lesson, Paul's suffering benefited the church by providing a powerful witness to the gospel, encouraging the church, and completing the sufferings of Christ. By contrast, the false teachers in Colosse were neither imprisoned nor persecuted. By highlighting his willingness to suffer on behalf of the church, Paul made it clear that Christ's ministers were more altruistic than the false teachers. I have become [the church's] servant by the commission God gave me to present to you the word of God in its fullness (Colossians 1:25). As we see here, God himself called Paul as an apostle. In his younger days, Paul had been a zealous persecutor of the church. But then the risen Lord Jesus had appeared to Paul and converted him. At this time, Jesus also appointed Paul to be his apostle, giving him authority to speak on Jesus' behalf. This meant that Paul's authority was far superior to that of the false teachers. The false teachers relied on ideas that idolatrous human beings had invented. Unlike Paul, they had not been granted authority to speak for God, and had not been called by God to teach the church. I tell you this so that no one may deceive you by fine-sounding arguments (Colossians 2:4). Paul described the words of the false teachers as "deceptive." And by contrast, his own words revealed the truth, helping Christians avoid the false teachers' deception. In fact, according to Galatians 1:15-18, Paul had spent three years in the desert of Arabia and in Damascus receiving revelations from God. The false teachers, however, relied on traditions that had been passed down through human hands. This made Paul's revelations far superior to those of the false teachers. Now, it was very significant that Paul's revelations came from God, that they were not mere human inventions like the teachings of the heretics in Colosse. But even more importantly, the content of Paul's revelations was superior to the false teachings in Colosse. In his letter to the Colossian church, Paul described his revelations as a "mystery" that God had revealed to him, and as "treasures of wisdom and knowledge." And Paul did not keep these treasures to himself — they were the very gospel that he preached. They were the truths of reconciliation to God and participation in his kingdom, on the basis of Christ's sacrifice, received by means of faith. This proclamation was better than anything the false teachers offered. I labor, struggling with all his energy, which so powerfully works in me (Colossians 1:29). Paul's authority, words and power came from God himself. And the false teachers in Colosse could not compare. Their ministry and their message were devoid of power and worthless in meaning. In summary, then, we see that Paul emphasized the superiority of Christ's ministers by writing about: the reconciliation accomplished through the Christian gospel, their altruism, their divine commission, the revelation they had received, and their empowerment by the Holy Spirit. Third, after emphasizing the supremacy of Christ and his ministers, Paul insisted on the supremacy of salvation in Christ in 2:6-23. Paul's discussion of the supremacy of salvation in Christ divided into two main sections: his praise for life in union with Christ in Colossians 2:6-15, and his condemnation of life lived under subjection to the elements in Colossians 2:16-23. In the first section, Paul described several benefits of salvation in union with Christ, beginning with the benevolent and invigorating aspects of the Lordship of Christ in Colossians 2:6-10. For in Christ all the fullness of the Deity lives in bodily form, and you have been given fullness in Christ, who is the head over every power and authority (Colossians 2:9-10). Christ has divine authority over every other power. And because believers are united to Christ, they share in that divine authority. [You were] buried with him in baptism and raised with him through your faith in the power of God, who raised him from the dead (Colossians 2:12). Because we are united to Christ, believers participate not only in Christ's death, resulting in our forgiveness, but also in Christ's resurrection and life, resulting in the rebirth of our spirits. He forgave us all our sins, having canceled the written code … nailing it to the cross (Colossians 2:14-15). God's law condemns fallen mankind to death. But because we are united to Christ in his death, we have already died the death that the law requires. We have served our sentence, so that we are now free from all condemnation. Against the backdrop of these blessings in Christ, Paul condemned the message of the false teachers in Colosse. Life in union with Christ is characterized by the blessings of Christ's lordship. But life under subjection to the elements places one under the tyrannical lordship of man. As Paul wrote in Colossians 2:16-18, this results not only in man's judgment, but also in the loss of the blessings Christ offers. Further, whereas union with Christ produces spiritual vitality, subjection to the elements results in separation from Christ. As Paul indicated in Colossians 2 verse19, this results in spiritual weakness rather than strength, and stifles spiritual growth. Such regulations indeed have an appearance of wisdom, with their self-imposed worship, their false humility and their harsh treatment of the body, but they lack any value in restraining sensual indulgence (Colossians 2:23). Subjection to the false gods of the heretical teachers in Colosse resulted in harsh living that was of no use against sin. Although such harsh living was supposed to lead to blessings, the demons had no power to bless anyone. By contrast, union with Christ provided freedom rather than subjection, and truly destroyed the power of sin over the believer. Through these contrasting aspects of life in union with Christ and life lived under subjection to the elements, Paul demonstrated that the salvation offered in the true Christian gospel was far better than the so-called blessings purported by the false teachers in Colosse. Finally, after addressing the supremacy of Christ and his ministers, and of the salvation offered in Christ's gospel, Paul turned to the supremacy of Christian living in Colossians 3:1–4:6. In this section, Paul demonstrated that the Christian lifestyle is far more ethical than the lifestyle advocated by the false teachers. The false teachers in Colosse seem to have been very concerned with ethical living. After all, the goal of their harsh living was to avoid fleshly indulgence. And in some respects, it may have been that their ethical standards or goals agreed with those of the Christian church regarding these kinds of sins. But there was a problem with their approach. Simply put, asceticism doesn't work. The fact of the matter is that fallen human beings lack the will power to resist sin. So, no matter how hard we fight to avoid sin, we always lose. This means that in order to live ethically, in order to obey the ethical standards that God has set for us, we have to rely on something bigger and more powerful than ourselves. Set your minds on things above, not on earthly things (Colossians 3:2). Put to death … whatever belongs to your earthly nature: sexual immorality, impurity, lust, evil desires and greed, which is idolatry (Colossians 3:5). Paul agreed with the false teachers that fleshly indulgence is evil. But he disagreed on how to avoid such sin. Do not handle! Do not taste! Do not touch! (Colossians 2:21). Although the ascetics claimed to point to the spiritual realm, their teachings focused on mundane, earthly matters. The ascetics seem to have been so preoccupied with their ascetic practices that they did not bother to emphasize ideals that were truly heavenly and spiritual. Although their goal may have been spiritual, all their efforts were spent on earthly things. Paul, on the other hand, taught specific ways that believers could focus on and strive for things that were spiritually oriented. He insisted that they cease their earthly sins, but he also knew that this was impossible from a fallen, human perspective. Listen to his words in Colossians 3:9-11. You have taken off your old self with its practices and have put on the new self, which is being renewed in knowledge in the image of its Creator… Christ is all, and is in all (Colossians 3:9-11). Paul explained that the key to ethical living is this: Believers are united to Christ — Christ is in all. And because of this union with Christ, we have "new selves" or "new natures." And we are being inwardly renewed by God. This union and renewal enable us to live ethically. The false teachers were not true believers. They did not believe the gospel, and therefore they were not united to Christ. They did not have new natures, and they were not being renewed by God. As a result, all their attempts to avoid sin were doomed to failure. Therefore, as God's chosen people, holy and dearly loved, clothe yourselves with compassion, kindness, humility, gentleness and patience (Colossians 3:12). Paul suggested that believers can succeed in ethical living by emphasizing heavenly, spiritual virtues like compassion and kindness rather than by focusing on the sins we are trying to avoid. And we can be motivated to live ethically by focusing on God's love for us and choice of us rather than by concentrating our efforts on placating the whims of false gods. Paul's strategy for ethical living was superior to that of the false teachers in two very important ways. First, it was effective because it relied on God's power rather than on man's. Second, it was effective because it focused attention away from sin and earthly matters, and onto positive virtues and spiritual values. And the bottom line was that Paul's strategy worked. Unlike ascetic practices which are of no value against sin, Paul's method actually made ethical living possible. Paul's letter to the Colossians was designed to address the idolatrous heresies introduced by the false teachers. The false teachers advocated pagan ways of relating to the spiritual powers, and ineffective ways of pursuing righteousness. In response to these problems, Paul preached Christ. He preached the supremacy of Christ as lord and king, and the superiority of Christ's ministers. He preached the incomparable value of salvation in Christ, and victory over sin through Christian living. At each and every point, he made it clear that what the false teachers promised, only Christ could deliver. Now that we have explored the background to Paul's letter to the Colossians, and its structure and content, we should turn our attention to our third subject: the modern application of Paul's letter to the Colossians. How can we, as modern Christians, apply these ancient teachings to our lives? Although there are many ways we might rightly apply Paul's teaching to our modern lives, we will focus on the two types of application that most concerned Paul and his original audience: the necessity of remaining loyal to Christ alone; and the value of focusing on spiritual matters on a daily basis. Let's begin by looking at the necessity of remaining loyal to Christ alone. In the Colossian church, the believers were being encouraged to mix their worship of Christ with the worship of other spiritual powers. Although these other spiritual powers were not presented as demons, we have seen that any power they actually had, and any benefits that actually came to their worshipers, were demonic. But whether these powers were demons or elements or angels, the Colossians should not have worshiped them. Sadly, the social climate of the first century made it hard for the Colossians to see the truth of this matter. During the first century, the dominant religious ideas in the Roman Empire were polytheistic. That is, most people believed that there were multiple gods and spiritual powers. And most societies within the Empire not only acknowledged the existence of many gods, but also worshiped many gods. For most people with the Roman Empire at this time, it was normal to worship the dominant gods of the civic cult, such as Zeus, as well as local gods and even household gods. So, although Christ demanded that believers worship him exclusively, there was great social pressure encouraging the early Christians to worship other gods as well. In fact, when the Roman Empire began to persecute Christians during the first century, it was largely because the Christians refused to acknowledge and to worship the gods of the civic cult. It was argued that the Christians had angered the gods by refusing to worship them, and that the gods would punish the whole of Roman society if the Christians were not called to account. The Romans did not demand that Christians stop worshiping Christ, but only that they also worship the Roman gods. [God] has reconciled you by Christ's physical body through death to present you holy in his sight, without blemish and free from accusation — if you continue in your faith, established and firm, not moved from the hope held out in the gospel (Colossians 1:21-23). If we do not remain faithful to Christ, then we prove that we have not been truly reconciled to God. And if we are not reconciled to God, then we do not share in the hope held out in the gospel. Simply put, if we do not remain faithful to Christ, we are not saved. Loyalty to Christ is of utmost importance. Sadly, our modern world frequently challenges our loyalty to Christ by presenting many different gods for us to worship. Polytheism can be found in eastern religions such as: Taoism, one of the three classical religions of China; Hinduism, the dominant religion of India; and Shinto, the traditional religion of Japan. And in the western world, the New Age movement has adopted many aspects of these eastern religions. Beyond this, Mormonism teaches that Mormons are gods in the making. Then, too, there are many smaller polytheistic religions, from tribal and folk religions in Africa and Asia to Scientology in Hollywood, California. The list could go on and on. But modern Christians also face additional problems. For instance, some modern governments and societies persecute Christians if they remain loyal to Christ alone. This is why many of the churches in the People's Republic of China remain underground. And in Islamic nations, persecution against Christians often results in slavery and even death. But as horrifying as these persecutions may be, and as much as they may press us to reject our Lord, we must remain loyal to our Christ — even unto martyrdom — if we are to be reconciled to God. In other modern societies, Christians are constantly pressured by atheism, so that they are encouraged to abandon all belief in God and Christ. Christianity is often ridiculed as a primitive and barbaric set of beliefs that cannot stand the scrutiny of science. Many believers who have not studied theology and science sufficiently are unable to provide answers to these challenges, and their faith is shaken. In other cases, the philosophical relativism of modern society leads to a strong insistence on religious tolerance. As a result, all exclusive claims to truth and salvation are condemned. Paul taught that loyalty to Christ is the only way to salvation. But when modern Christians echo this idea, we are often accused of arrogance and intolerance. And we feel pressured by society to acknowledge other ways of finding eternal blessings. But not all pressures come from outside the church. For instance, in some liberal Protestant churches, praise is now offered to Wisdom or Sophia, who is personified as a female deity. Other liberal Protestant churches endorse the philosophical relativism of their societies, teaching that many or even all religions are valid paths to salvation — even if they deny Christ. The truth is that no matter where we live, it is likely that we feel pressures to be disloyal to Christ. These may be pressures to accept the validity of other religions and gods, or pressures to deny the God of the Bible. They may come from the government, from our schools, from our neighbors and friends, from our families, or even from our church leaders. But if we are to remain true to Paul's teachings, we must reject these false notions and embrace Christ alone. Only Christ is worthy of worship, and only he offers true salvation and spiritual blessings. Just like Paul, modern Christians must condemn the worship of spiritual beings other than the God of the Bible, and we must insist that Christ is the only one who can reconcile us to God. Even when false teachings come from people we love and respect — even if those people are leaders within our churches — we must remain steadfast in our loyalty to Christ alone. Now that we have looked at the importance of remaining loyal to Christ alone, we should turn to our second type of modern application: the value of focusing on spiritual matters every day of our life. Although attention to earthly matters is of some value, we benefit most greatly when we approach life from a spiritual perspective. When we come to faith in Christ, a miraculous thing happens: our spirits are renewed within us. Before we come to faith, we are dead on the inside, unable to respond positively to God. We are God's enemies not only because we have sinned against him and deserve his judgment, but also because we hate him and will not submit to him. But God loves us so much that he refuses to allow us to remain his enemies. So, he sends the Holy Spirit to renew our spirits, so that we are inwardly restored, and so that we eagerly repent of our sin and submit to our Lord. At the same time, the Spirit of God indwells us, uniting us to Christ, and guaranteeing our future blessings in him. Our salvation does not depend upon our earthly pursuits, but upon the spiritual realities of our restored spirits and our union with Christ. And it is for this reason that Paul encouraged the Colossians to focus less on earthly matters and more on spiritual ones. Theologians often describe those who have not come to faith as unregenerate. By contrast, the term regenerate is applied to those who have faith. These terms identify the state of the spirit or soul of each person. To be unregenerate is to be spiritually dead, and to be regenerate is to be spiritually alive. Those who are unregenerate are under God's judgment because of sin. Also, they have no moral ability, that is, they cannot do things that God counts as morally pure. Moreover, they have no moral desire, that is, they do not want to do things that God counts as morally pure. In short, the unregenerate are not saved, cannot save themselves, and do not want to be saved by God. On the other hand, those who are regenerate are forgiven because they are united to Christ, who died for their sin according to the requirements of God's law. Further, their renewed spirits possess moral ability, so that they are able to obey God, as well as moral desire, so that they also want to obey God. We were once dead in our sins, meaning that we were under God's judgment. But then God made us alive and forgave our sins. We were also dead in our sinful nature, meaning that we had evil natures, with no moral ability or desire. But again, God made us alive. As a result, we now have the ability to desire good and to do good. Since, then, you have been raised with Christ, set your hearts on things above, where Christ is seated at the right hand of God. Set your minds on things above, not on earthly things (Colossians 3:1-2). Because we are seated above with Christ, we should focus our minds on things that pertain to heaven. We are now aware of the true authority structure of the universe; we know how the world works, and what things bring true blessings. And this knowledge should change the way we live our lives. Now, at some points in history, Christians have mistakenly thought that when Paul said to focus on heavenly things and not on earthly things, he meant that we should withdraw from the normal human life in order to pursue heaven without distraction. The medieval ascetic monks are a good example of this type of thinking. Some lived as hermits, sequestered from the rest of society. Some sat in caves or on top of poles for huge periods of time. Others caused themselves physical harm. They earnestly believed that the best way to grow spiritually is to escape the influence of the normal, unspiritual world. But they were wrong. In fact, in some respects, they made the same mistakes that the false teachers in Colosse had made. Clothe yourselves with compassion, kindness, humility, gentleness and patience… Forgive as the Lord forgave you. And over all these virtues put on love, which binds them all together in perfect unity. Let the peace of Christ rule in your hearts, since as members of one body you were called to peace. And be thankful. Let the word of Christ dwell in you richly (Colossians 3:12-16). In essence, Paul said that the "heavenly" or "spiritual" things in life are those that reflect the state of God's kingdom as it is manifested in heaven. Or to put it another way, to be heavenly minded is to focus on the one who has ascended to heaven, namely Christ, in order that we might be more like him while we are here on earth. And notice the kinds of matters that Paul called "heavenly" or "spiritual." Most of them are interactive virtues, virtues that are primarily, and in some cases only, expressed toward other people, such as compassion, kindness, humility, gentleness, patience, forgiveness, love, and peace in the context of community. These virtues cannot be exercised apart from active life in the present world. And in fact, in Colossians 3:16–4:6, Paul explained many different ways that believers can apply these virtues within the context of their many earthly relationships. For instance, he wrote that believers should teach and admonish one another by singing psalms, hymns and spiritual songs together. He directed wives to submit to their husbands, and husbands to love their wives. He instructed children to obey their parents, and parents to encourage their children. He exhorted slaves to be obedient and productive, and he commanded masters to treat their slaves in the same way that Jesus, who is the master of us all, treats his church. He asked for prayers that God would strengthen him as he proclaimed the gospel. And he directed the Colossians to be diligent and wise when their own opportunities for evangelism arose. All of these instructions pertain to "spiritual" or "heavenly" matters. And yet they can only be carried out through active involvement in the present world. For Paul, to be heavenly or spiritually minded is to reflect on how wonderful heaven is right now, and to find ways of making the present world more like heaven. It is to concentrate on our new spiritual natures, and on the good works that are appropriate to them. It is to do the same good works on earth that are always done in heaven. It is to love others, to forgive others, to be kind and gentle and humble. It is to treat others in the same way that Jesus treats them. In short, in order to focus on spiritual matters, we have to concentrate on building the kingdom of God — right here, right now, on this earth. In this lesson we have taken a close look at the apostle Paul and his association with believers in Colosse. We have explored the background of Paul's letter to the Colossians, as well as its structure and content. Finally, we have discussed the modern application of the teachings the Colossians received from Paul. Paul's letter to the Colossians contains many important lessons for us today. It teaches us about Christ's supremacy, and of the high regard we should have for his apostles and their teachings. It explains our role in the kingdom of God, and the great salvation we now enjoy. And it encourages us to live with spiritual attitudes, as people who participate in heaven, and work to bring our heavenly values to earth. As we move forward in our Christian lives, remembering the lessons Paul taught in this letter will help us maintain our faith, and live as productive and blessed members of God's kingdom.